When I was a child I owned a book called ‘I’m a Roundy, You’re a Squary’, by Roger Hargreaves. I was both baffled and fascinated by this book; never exactly sure what it was trying to say, but feeling that whatever it was, it was deeply important. Throughout the book comparisons are made between ‘Roundies’ and ‘Squaries. Roundies, according to the book, have a sense of humour, while Squaries are are terribly sensible; Roundies wear sandals while Squaries wear shoes, and so on. What the book suggested to my younger self was, that you were either a Roundy or a Squary, and that to be a Squary was not a good thing. But I wore both sandals and shoes, I liked to both have my own adventures, and to watch other peoples’ adventures on television. So, either one’s sense of oneself was far more complicated, and less fixed than the book was suggesting, or there was a whole other undisclosed set of shapes that you might possibly be. I was perplexed. I was similarly perplexed, as an adult, when I read artist Lawrence Weiner’s assertion that he could not be a poet because ‘…literature is essentially about subjective reality, and art is essentially about an objective reality’ (1,p178). Bualking at the Hargreaves-style categorisation of art and poetry I made a list of artists who make subjective work: Tracey Emin, Frida Kahlo, Felix Gonzalez Torres, Louise Bourgeois, Yayoi Kusama and Grayson Perry to name a few. Producing a list poets who write objective poems however, was less easy. The work of Concrete Poets such as Ian Hamilton Finlay and Dom Sylvester and some of the Imagist poetry by William Carlos Williams and Ezra Pound could be said to fit the bill, but beyond that pickings are slim. 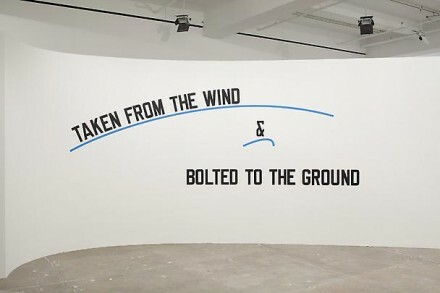 Interestingly I find Weiner’s work more ‘poetic’ than any of Finlay’s or Sylvester’s Concrete Poetry. Indeed, dispute his assertions that he is not a poet; the artist himself acknowledges that there are poetic elements to his work; he would like people to read it aloud to themselves and for it to sound good(2), common concerns of most of poets. He wants his work to ‘show not tell’ (2) (stalwart advice from all good poetry teachers). He doesn’t see the need for explanatory text to accompany his work, and clearly he is playing with language – its rhythms, its meaning in different contexts, its commonality across cultures and its use as raw material. So, is it really so clear that we shouldn’t call him a poet? Can being objective really rule out someones credentials as a poet? Certainly there is more to good poetry than its subjectivity. In her article ‘Someone is Writing a Poem’ 1993 (3) Adrienne Rich talks of how, in poetry, ‘a partly common language exists to which strangers can bring their own heartbeat, memories, images. A language that itself has learned from the heartbeat, memories, images of strangers’ a sentiment we could easily apply to Weiner’s work. So, whilst I’ve no desire to see Weiner forced to accept the title of poet, any more than I wanted to be declared categorically a Roundy or a Squary, I shan’t be dissuaded from calling him my favourite Objective Poet.